1 Ph. D. Universidad Pedagógica y Tecnológica de Colombia (Sogamoso-Boyacá, Colombia). jorge.marino@uptc.edu.co. ORCID: 0000-0001-5105-2095. 2 Investigador Independiente (Colombia). ORCID: 0000-0002- 8680-5293. 3 Geotomografía Ing. de Pozos Ltda. (Sogamoso-Boyacá, Colombia). andres.martinez@geotomografia.com. ORCID: 0000-0002-3524-3745. Reconocer la conexión hidráulica entre la zona de recarga y la zona de descarga en acuíferos solo es posible mediante el uso de trazadores, y los isótopos de 18O y 2H han probado ser buenos trazadores. En Ibagué y el lago de Tota se supone que la recarga de los acuíferos en la parte baja se da no solamente por infiltración vertical directa, sino también por precipitación e infiltración en las montañas altas, para luego infiltrarse regionalmente hasta alimentar los acuíferos en la parte baja. En Tota, los valores delta (δ) para el 18O son más ligeros en la parte alta que en la parte baja; en la parte alta los valores están cerca de -10 9%, mientras que los de la parte baja están en torno a -3 %%. En Ibagué, los valores 5 para el 18O son, igualmente, más bajos en la parte alta que en la parte baja; en la parte alta están entre -8 y -11 %, mientras que en la parte baja están entre -7 y -9 %. En ambos casos, la diferencia isotópica entre los valores de la parte alta y los de la parte baja podría indicar que no toda la infiltración de los acuíferos en la parte baja proviene de la recarga por la precipitación en la parte montañosa alta, y, por lo tanto, esa recarga adicional sería producto de la precipitación y la infiltración en la parte baja. The most commonly used aquifers in Colombia are localized in low and flat areas where people are settled and commercial activity is carried out. Those aquifers are usually formed by quaternary deposits originated from alluvial or fluvial-lacustrine environments. Advance in studies to determine balance and water availability and project sustainability in such aquifers are not only required, but also necessary to establish the hydraulic connection between different zones, the origin of precipitation, and the amount of recharge or infiltration of the aquifers. In Colombia, the aquifer studies supported by isotopic analysis are scarce. Betancur  used isotopes to better understand the behavior of an aquifer in the lower Antioquenian Cauca. Herrera and Gutiérrez  used isotopes for a clearer understanding of the components of the hydrologic cycle in the Morrosquillo aquifer (Sucre); they found that the precipitation water not only originated from the Caribbean Sea, but also from the Magdalena River valley. In eastern Boyacá, most of the precipitation comes from the basin of the Llanos Orientales (Eastern Plains), which in turn comes from the Amazonian basin and the Caribbean Sea through the Lake Maracaibo. As clouds shift towards the west, they are expected to loss water charge, while simultaneously decrease isotopically. It is suspected that a great amount of precipitation water in the zone of the Ibagué fan proceeds from the basin of the Magdalena River valley, and similarly, that the precipitation and isotopic composition lower from east to west . In both cases, it is thought that the recharge of the aquifers in the lower part exists both from direct vertical infiltration and from precipitation and eastward infiltration in high mountains, which later infiltrates regionally until reaching the aquifers in the lower part. To prove the hypothesis of water depletion towards the west and the hypothesis of direct vertical recharge or regional underground recharge of the aquifers in the Lake Tota and the Ibagué fan, we sampled and correlated infiltration waters from higher and lower parts, using isotopic analysis of deuterium (2H) and oxygen 18 (18O). Isotopic techniques, combined with hydrogeological studies in which hydrogeochemical techniques have been used, contribute to a better understanding of the hydrogeological cycle and the aquifer functioning; in addition, they allow those in charge of the hydric resource to advance in the required actions to preserve and increase the aquifer's potential. Lake Tota is situated in the eastern central part of the Eastern Cordillera at 3015 meters above sea level in the Aquitania valley (Fig. 1). Lake Tota was formed during the Miocene as part of the Andean orogeny, which led to the formation of the Eastern Cordillera. The surface of the lake is 60 km2 and its average depth is 32 m . Cretaceous-Tertiary materials of sand-clayey composition as the Guadalupe group form the area of the lake. Some important faults also pass through it . To the north of the lake, the cold wilderness of Sarna and Siscunsi are located, and the Hato-Laguna and Los Pozos rivers, which sustain the lake, are born. To the south, the Upia River, the only effluent of the lake, is born. FIG. 1 Location of the Lake Tota and the Ibagué fan. Conventional water balance studies of the Lake Tota have shown an imbalance that could derive from water infiltration in the lake bed towards lower zones, like the hydro thermal waters of Iza [2,11]. Such water leakage could happen through the fractured lidites of the Guadalupe group. An additional water balance study, in which isotopic techniques were used, quantified the underground components of water balance [10,11]. The analysis made by Rozansky  failed to determine the cause of the imbalance in the water balance equation, but did find that the water from the lake has a different isotopic composition from the one of the rivers, and that the different depths of the lake present a similar isotopic composition, indicating chemical homogeneity and good mix of water. Veloza  also determined that the isotopic composition of the lake is uniform, indicating that the water renovation is slow, and that the residence time is long. His isotopic studies, applying the mass balance equation, lead to conclude that there is an underground water escape of the lake. Ibagué is located in the eastern side of the Central Cordillera (Fig. 1); it is a plain constituted by deposits of alluvial, alluvio-torrential, volcanic, and fluvio-volcanic origin. Such plain is inclined to the east towards the Magdalena River valley. The fan is a quaternary Neogene deposit, mostly made up of volcanic fluids from the Nevado del Ruiz and the Machin Volcanos located west from Ibagué . This deposit is characterized by having a high or proximal zone where it is suspected that a great part of the fan aquifers recharge, and where the grain size of the rock is larger in diameter in relation to the lower and distal zone. Consequently, the use of stable isotopes was determined as a complement to the geological, geophysical, and geochemical studies to establish the hydraulic connection . As a hypothesis, the values of delta (δ) that come from the recharge of the high part must be lower (depleted) than those found in springs, cisterns, and wells. Therefore, the rivers could be sampled in the higher part, which would represent the isotopic composition of rain; and springs, cisterns and wells must be sampled in the lower part (Fig. 2). If the water of the wells and cisterns of the aquifer is depleted isotopically, it was recharged in the high part; if, on the contrary, it is enriched, it might had been recharged by direct precipitation above the aquifer in the lower parts. FIG. 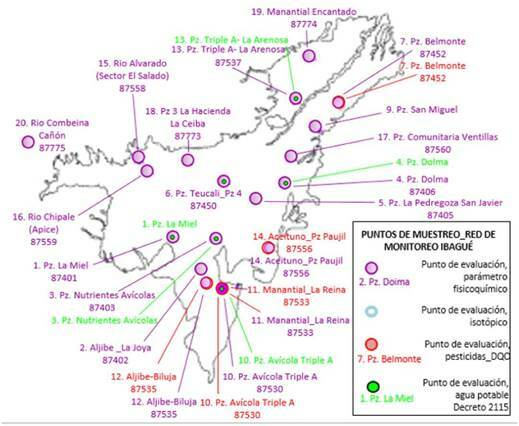 2 Delimitation of the study zone (Ibagué fan) and location of each sample analyzed for isotopes. Sedimentary and igneous-metamorphic rocks that are in the zone can affect the isotopic composition of the recharge waters; however, it is expected that the water-rock contact has extended to a point where the isotopic composition of water dominates . Isotopes are atoms that have the same number of protons and same atomic number, but have a different number of neutrons and therefore different mass. There are two types of isotopes: stable and unstable. The unstable or radio isotopic suffer nuclear transformations with the emission of known radiations known as radioactivity. Stable isotopes do not emit radiation, therefore they are not harmful. For the present study, we chose deuterium (2H), which is an isotope of hydrogen, and oxygen 18 (18O), an isotope of oxygen; these isotopes always occur naturally in water . The isotopic composition of a sample is expressed in relative terms instead of absolute terms. Stable isotopes are expressed by reference to a standard named SMOW (Standard Mean Ocean Water). Data is expressed in deviation units δ (delta) in regards to the standard. The most widely used standards for stable isotopes of water are SMOW and VSMOW or Vienna, which is the standard used by the International Organization of Atomic Energy (IOAE) with headquarters in Vienna (Austria). Here, we used the VSMOW standard. The values of delta (δ) in equation (1) represent the relation between the isotopic values of the sample and the standard isotopic values. The isotopic composition of each sample can be expressed as the relation (R) of the isotopic abundance of the heavy isotope divided by the abundance of the light isotope . Where, Rsample is the relation 18O/16O of the sample, and Rstandard is the relation 18O/16O of the standard. δ is expressed, according to equation (2), in terms of the difference per thousand (‰) between the relations of the sample and the standard. In general, a positive value of 5 indicates that the sample has been enriched in the heavy isotope in relation to the standard, while a negative value indicates the opposite. The existent relation between the 2H and the 18O is established through an equation resulting from numerous measurements performed with samples of rain water or precipitation; this relation corresponds to a straight line with a definite slope named precipitation line, represented in an axis of a Cartesian coordinate system (d2H vs d18O) (Fig. 4). For the case of Lake Tota, the meteoric or precipitation line is expressed by d2H= 8.84 d18O + 19. The values of 2H and 18O decrease as they depart from the source where they were evaporated, and as they precipitate at a higher elevation [4,11]. For the case of a lake, reservoir or any mass of water exposed to direct evaporation, a change is produced in the d2H and d18O relation, obtaining a straight line named evaporation line, with a slope that varies between 4 and 6; in Lake Tota, the evaporation line was obtained after analyzing various samples, and is represented by equation (3). In Tota and Ibagué, the main idea was to determine the hydraulic connection between the systems of the upper part and the systems of the lower part. If the isotopic values are equal or similar, it is assumed that the systems of the lower part are recharged by underground water provided by rain and the rivers of the upper part. On the contrary, if the values are very different, we can assume that the main recharge of the lower part is provided by precipitation (local vertical infiltration) that must be more enriched (or less depleted) than in the upper part . The isotopic study was performed in the interior of the lake and in its basin. The most important sampling sites of the system were defined after analyzing and comprehending the hydrogeological and meteorological information [2,11]. The Hato-Laguna and Los Pozos rivers, which originate in the cold wilderness of Sarna and Siscunsi, northeast of the lake, were sampled to represent the isotopic composition given in the upper part due to precipitation. Because the precipitation of the upper part is located further up north, a relative isotopic decrease is expected. The lower part is almost completely covered by the Lake Tota; therefore, we sampled directly above the lake at different depths (surface, 1, 5, 10, 20, and 40 m). The sites sampled above the lake were Playa Blanca, El Tunel, Lago Chico, Lago Grande Sur, and Lago Grande Norte (Fig. 3). The isotopic sampling in the Lake Tota was repeated 13 times from September 1999 to September 2000 [10,11]; thus, the isotopic results are an average of the 13 months of sampling. 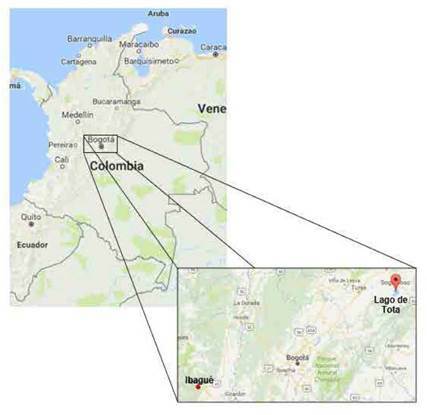 The isotopic analysis of the samples was conducted in the laboratory of the International Atomic Energy Agency (IAEA) in Vienna (Austria) as part of a collaborative research with UPTC and Corpoboyaca (Col-8-021-02). FIG. 3 Lake Tota sampling sites. In this area, the sampling was performed considering an upper and a lower part of the Ibagué fan. The upper part was represented by the rivers Combeima and Alvarado, and by the canyons; in the upper part, the recharge is given by direct precipitation and a decrease of the isotopic values is expected. The lower part was represented by the wells, the reservoirs, and the springs; in this part, an isotopic enrichment is expected. Figure 2 shows the location of the 21 sampling sites. The four upper part samples were Combeima Canyon (8), Combeima River (20), Alvarado River (15), and Chípalo River (16). The remaining samples corresponded to the lower part. The sampling in the lower part was divided into four sectors: wells, rivers, reservoirs, and springs (Table 2). The isotopic analysis was performed by Isotech laboratories, subsidiary of the Weatherford Company, located in Champain, Illinois (United States). Table 1 presents the average isotopic composition of the samples in the Lake Tota and its surroundings. The upper part sector corresponds to the Hato-Laguna and Los Pozos rivers. The lower part sector corresponds to the isotopic average of the precipitation in the Santa Inés station, close to Los Pozos River, and to the isotopic average of the samples taken in the lake (Playa Blanca, Lago Grande Sur, Lago Grande Norte, Lago Chico, and El Túnel) (Fig. 3). Because the Hato-Laguna and Los Pozos rivers are tributary of the Lake Tota and originate in the Sarna and Siscunsi wilderness, their samples can be considered as being from the upper part or recharge zone; these samples presented 5 values for 2H from -75 to -77 %%, while the lower part samples showed higher values from -32 to -35 %%. The maxims of the lower part were in the Lake Chico samples in the northern part, close to the Aquitania town, while the minimums were shown by playa Blanca in the southern part of the lake. Similarly, the delta (δ) values for 18O showed lower values (depleted) in the higher part compared to the lower part: in the upper part the values were around -10 %%, while in the lower part were close to -3 %%. The isotopic values of the water taken from the Lake Tota were constant through time; this is due to the great volume present in the lake, that is, the lake is isotopically unaffected by the water that feeds it on a short term basis because the existing water has a residency time of 19 years; hence, the isotopic composition cannot change in such a short period of time . Table 2 represents the isotopic composition of the sampling points of the Ibagué fan. The samples of the upper part or recharge zone (Combeima, Alvarado and Chipalo rivers) presented 5 values for Deuterium between -58 and -77 %%, while for the lower part the values were higher, between -55 and -66 %. The highest values in the lower part were found in the samples taken in springs, while the lowest were found in the Opia River (Table 2). Delta (5) values for oxygen 18 (18O) were equally lower (or depleted) in the upper part than in the lower part: in the upper part the values were between -8 and -11 %%, while in the lower part were between -7 and -9 ‰. In this area, the isotopic composition of the rivers from the upper part was relatively homogeneous and slightly lower or depleted than the precipitation from the Santa Inés station, however, it was much more negative than the water from the lake at different depths (Table 1). This result is expected since the capturing areas of rivers are located at a higher elevation than the lake. The closeness of the isotopic values of the rivers and the precipitation (Santa Inés station) suggests that the runoff waters have a minimum contribution to the total download of the rivers, and that the evaporation effects are minimum. The isotopic values of the samples taken in different points of the lake were very similar, indicating that the waters from the lake are well mixed vertically and horizontally. This same homogeneity was noticed during the sampling performed for 13 consecutive months . Overall, the progressive isotopic depletion observed from the lake samples to the wilderness samples in the north represents a normal natural phenomenon of decrease in the isotopic values of rainwater when moving away from the source of humidity (Amazonas Basin and Caribbean Sea). FIG 4. δD versus δ 18O from the precipitation (superior line) and from the Lake Tota water (evaporation line-inferior line). In Tota, the sampling was done in 13 consecutive months and showed that the isotopic composition of the lake does not vary much with regard to time. On the contrary, the isotopic composition of rivers varied slightly due to the changes in temperature throughout the year, and the isotopic composition of the springs remained uniform possibly indicating a same recharge source . A progressive isotopic depletion of the samples from the fan lower or distal part (wells and reservoirs) towards the upper or proximal part (rivers of the Central Cordillera foothill) was observed. This result shows a natural depletion phenomenon of isotopic values from water rain, as they move away from the middle Magdalena valley towards the Central Cordillera because it is assumed that the Magdalena River is one of the main sources of humidity in the zone. The isotopic composition of the rain seems to be reflecting on rivers and aquifers. If the isotopic values of 2H and18O of the upper and lower parts are plotted together, the samples taken in the upper parts (Fig. 5, green color) are depleted in relation both to the lower parts and the global meteoric line (Fig. 5). FIG. 5 δD values versus δ18O values of the samples from the Ibagué fan. The red points represent the extremes of the global meteoric waterline (global meteoric water line-GMWL- superior line). The blue points represent samples of the upper part and the green points represent samples from the lower part (lower line) (Table 2). If the isotopic composition from the samples and the global meteoric line of water (GMWL) are compared, it is clear that the isotopic values of the Ibagué fan are, in general, more depleted than the values of the global meteoric water because this zone is closer to the equator, and also because a greater evaporation was presented by being close to an elevated mountain chain (Fig. 5). The isotopic values of the samples from the upper part (Table 2) matched, to a closer degree, the global meteoric water line -GMWL, while the values from the lower part of the fan (Fig. 5, green color) suffered a lower depletion, by having a shorter journey or trajectory, and therefore, less isotopic fractioning, which explains why they are more enriched in comparison with the isotopic values of the upper part. The isotopic difference between the values of the upper and the lower part could indicate that not all aquifer infiltration in the lower part comes from the precipitation in the high mountain part, and therefore, that additional recharge would be a product of direct precipitation in the lower part, with infiltration being facilitated by the fan good permeability since it is mainly composed of gravels. The greatest isotopic difference was observed between the rivers of the upper part and the springs of the lower part, which would confirm that the hydraulic connection between the infiltration of the upper part and the springs is lower than commonly thought [3,7]. Consequently, we would confirm the hypothesis that the delta (δ) values of the recharge from the upper part are lower (i.e., they are depleted with regard to the VSMOW standard) than the delta (δ) values found in springs, reservoirs and wells. The enriched aquifer water that feed wells, reservoirs, and springs might have been recharged by precipitation directly above the unconfined aquifer (Fig. 6). This could mean that the vertical recharge of rain in the aquifers of the zone is of greater importance than the lateral recharge received in the upper part. This vertical recharge matches the aquifers high permeability, especially in Ibaqué, which is mainly composed of lithofacies of gravels and sandstones with low consolidation, and therefore, depends on the precipitation in the zone, which fortunately is high. All this confirm recent research that indicates that the recharge through quaternaries and floors, in relatively flat zones, is greater than what was generally considered . FIG. 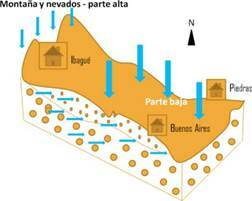 6 Conceptual model of the Ibagué fan, showing that vertical recharge through the unconfined aquifer in the lower part is greater than the recharge in the upper part (mountains and glaciers of the western zone). The vertical and direct recharge of the aquifers, which also present low coverage and closeness to the surface, makes them vulnerable to pollution. Additionally, the recharge and the level of the aquifers is directly correlated with the precipitation and the level of exploitation. It is recommended to correlate the isotopic analysis with geochemical analysis, alongside geologic and climatic data for evaluating the hypothesis better. In Tota, it is recommended to sample the thermal water of Iza-Cuitiva to determine its correlation. It is also recommended to deepen the relation between the isotopic contents of the lake and those of the spring. In Ibagué, it is recommended to replicate, at least once, the isotopic analysis of the samples in a rainy period, since the sampling was performed during the dry season. In both cases, for a better knowledge of the water age, it is recommended to perform the analysis of 14C and tritium; this is important, not only for the age, but also to verify the hydraulic correlation and connection between the different subsystems. Overall, the progressive isotopic depletion of the samples from the lower or distal part towards the upper or proximal part shows a natural phenomenon of depletion of the isotopic values of rainwater, as they move further away from the source of humidity. The isotopic difference between the values of the upper and lower parts could indicate that not all water contained in the aquifers of the lower part come from the recharge due to precipitation in the high mountain part; therefore, there is an additional recharge caused by infiltration of the precipitation in the lower part. Hence, recharge is a process of water mixture at different elevations. The isotopic study showed that the isotopic composition of the Lake Tota is uniform through time. The isotopic composition of the rivers varies due to the different changes in climatic conditions throughout the year, among other factors. In Ibagué, it is recommended to replicate, at least once, the isotopic analysis during the rainy season, since the sampling was performed during the dry season. In this area, the vertical recharge of the aquifers, the limited vegetal coverage, and the closeness of the phreatic level to the surface make it vulnerable to pollution. Additionally, the recharge and level of the aquifer is directly related to precipitation. In both cases, it is recommended to correlate isotopic analysis with geochemical analysis (ions), and with geologic and climatic data for a better verification of the hypothesis. Sampling for 14C and tritium is also recommended, since it would be helpful to determine the age of the water in different subsystems.